Okay, this will be a somewhat lengthy report--but hopefully of interest to regular ride report readers! It all got started when my college roommate, best friend, and periodic motorcycling buddy, Buzz, bought a new Suzuki V-Strom 650 with ABS. After he scuffed up the tires and bedded-in the brakes for 100 miles, we decided it was time for another Buzz & Rick Riding Adventure. We agreed to meet at Tygart Lake State Park in West Virginia, and to proceed from there. And speaking of log cabins, these two youngsters were intrigued by the tall, gawky, picture-takin' motorcyclist who pulled up in the road out front. Everywhere you looked, there were beautiful vistas--sometimes distant (as in the case of Saddle Mountain) and sometimes right in front of you (somebody's field). Although virtually all of our trip was on pavement, I occasionally found some dirt whilst searching for more pho-op's. Meanwhile, Fearless Buzz was continuing to break in his V-Strom, stopping every 45 minutes or so for a stretch and photo op. Back on Route 50, I crossed the Cheat River, which my Dad had canoed many a time back in his prime. Not far before Grafton, I encountered one of the weirder settings of the whole trip. Every imaginable antique farm implement was sitting somewhere in this yard. For good measure, there were several train cabooses in the background. As Calvin and Hobbes would have said, "There was treasure everywhere!" Eventually, both Buzz and I arrived at the Tygart Lake Lodge, where we admired each other's bikes and the view of the lake from our window, and compared notes on our adventures along the way. After a decent dinner at the Lodge, we hiked the trail to the dam holding the 13-mile-long lake in place (and found it to be the ugliest dam we'd ever seen! It clearly does not merit a picture.) Then we took advantage of the Lodge's wireless Internet access and Buzz's laptop to download our GPS data and check the next day's route. Eventually, after "40 Miles of Bad Roads," we ended up back on 219. As had been the case on many of the other roads in West Virginia so far, roughly 1/4 of the corners were carefully marked by gravel... Fortunately, we managed to avoid The Dreaded Sideslip on these corners, but it definitely made for a more sedate cornering technique than we might have employed otherwise. A former resort hotel might be undergoing renovation--but it has a long way to go. Eventually, we found the Green Bank Observatory, complete with fascinating public exhibits on how radio telescopes work. Among many other things, they had an infrared camera set up; just the thing for an impromptu self-portrait! These kids enjoyed the demonstration of convex versus concave mirrors. We signed up for the free bus tour of the grounds, which included a demonstration of some of the special techniques used to minimize interference in radio reception. Have you ever seen a baloon dunked in liquid nitrogen? Quite a sight. In this shot, the world's largest radio telescope can be seen in the background. Its dish is 2.3 acres, and it's approximately 500' high at its tallest point. Elsewhere, the grounds had a slightly surreal appearance to them, with other 'scopes sticking out above the treetops. We were joined on the tour by a rowdy crowd of motorcyclists--most of whom, as it turned out, were BMW riders from Philadelphia and New Jersey. They appeared on two more R12GS's, an LT, and a nifty 1100RS in yellow and checkered flag colors. Stopping overnight in Marlinton proved to be a great choice, principally because of the Old Clark Inn. Run by motorcyclists Nelson and Andrea, it offered covered MC-only parking (with air and other services), very nice accommodations, and good prices. It was originally built in 1924 as a residence hotel and operated by Lucy Clark, who appeared to have been a cheery soul. Dinner was a nearby walk at the River Place Restaurant. The service was slow but the food was decent. This was Buzz's kielbasa, which the waitress proudly proclaimed to be a WV specialty... Regardless, it was good! When we'd left Marlinton, it was only 40 degrees. By now, it was rapidly warming up, so it was a good time to de-layer. Later in the day, it reached 80 degrees, adding quite an element of Meteorological Diversity to the day. After a brief stop at Hawks Nest, we went in search of our major goal: The New River Gorge Bridge. Putting the GPS's to good use, Buzz quickly figured out how to get there. On the way, we crossed the New River on Route 16. Soon, we crossed on the New River Gorge Bridge on Route 19--the largest steel arch bridge in the country. The bridge is over 3000' long and nearly 900' high. In this picture, it's hard to grasp just how big this sucker is--but if you could see the cars and trucks on top of the bridge, they would appear just as teeny objects. The goal, of course, was to find a way down to the river itself. This involved diving headfirst (headlamp first?) down some of the steepest switchbacks we'd ever experienced. Originally, this was the only route across the gorge, and it took approximately 40 minutes! The road twisted and turned and occasionally ran underneath rock outcroppings such as the one here. The next photo shows that travel by car might have been even more adventurous than travel by motorcycle, in the late 1910s! Along the old route, we crossed the New River for the third time, on the third separate bridge. Someone had the nerve to park a yellow GS right on the bridge whilst taking pictures. Dang motorcyclists! ...and another pretty scene, this one Japanese! With all our exploring, the day was beginning to draw on. We had an enjoyable lunch at Tudor's Biscuit World (I can't wait until this chain comes to Maryland!) and then continued up 16. Along the way were more twisty-turny roads, largely absent gravel (hurray! ), which invited an aggressive riding style with constant left-right-left leaning the bikes well over. Great fun! Late in the day, we ended up on Route 50 and darted over to I-79 and a Hampton Inn at Bridgeport. A Bob Evans dinner and a dunk in the jacuzzi, and all was well! The next morning, it was time to go our separate ways. We oiled Buzz's chain, packed everything up, and off we went--Buzz to the legendary Route 800 in Ohio, which he took for most of his way home, and me to visit Morgantown, WV--where I lived from ages 1 1/2 through 5 1/2, while my Dad taught at the university. Thanks to the Zumo, I found my old house without difficulty. It had a later addition built on the near end, plus a stone retaining wall that didn't used to be there ... and it didn't used to have trees in the front yard! (That may say something about how long ago I lived there.) But it was definitely the right place. Down Grand Street a bit was the "castle" home of our friends, the Putnams. It was currently getting a new roof, which complicates the picture a bit, but it's still quite an impressive place. ...and also along a "street" that the Zumo positively swore was on the right route! Leaving town, I managed to find the original bridge over Cheat Lake, which I remembered from my childhood. Its trusses are not only rusted--they're cobwebbed! I took I-68 past Frostburg and Cumberland but then switched to Scenic 40--a real treat, for anyone headed that way. At the top of Town Hill, the Town Hill Hotel still stands proud and has been in operation since about 1920. Sadly, the rest of the town, which used to be a major waypoint for anyone traveling in this area, was mostly gone. But the spot still offered a magnificent vista, with I-68 way down there in the distance. Continuing on, I mis-read a Scenic 40 sign and turned left instead of right. (I shoulda programmed the route into the Zumo, but I was traveling mostly by SoP.) Before long, I was inadvertently in Pennsylvania, on roads that got smaller and smaller by the mile. Fortunately, you're never lost as long as you can see Sideling Hill! In the meantime, Buzz was long since home, along the way having encountered a freshly painted Mail Pouch Tobacco ad, the Sistersville Ferry (where he'd thought that his Garmin 2720 indicated a bridge), and a barn that wasn't quite built as solidly as a brick, uh, 'house. Finally, I realized that this house was the closest to civilization that I'd been in nearly an hour. I bit the bullet, told the Zumo to take me home, and arrived back in Catonsville a couple of hours later. It had been a fabulous trip all around: Outstanding weather, with not even one drop of rain; fascinating and challenging roads; unusual sights; and an A-Number-One riding buddy (who had thoughtfully laid out the route in the first place, and then modified it as necessary along the way). All told, it was 999.5 miles over the course of 4 days--and I'd do it again tomorrow! PS--Except that my GS is at Bob's for the dreaded clutch spline lube/repair. PPS--If I can figure it out, I'll post the MapSource routes we followed. PPPS--Many of the photos included here were taken by Buzz Barbu. 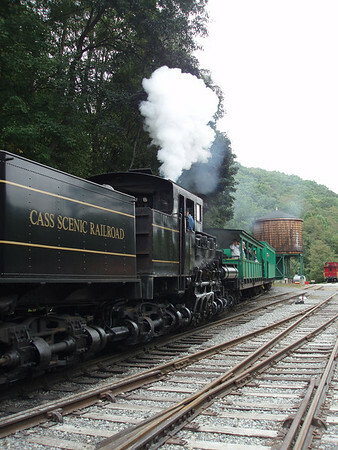 The picture of the Shay locomotive is courtesy of the Mountain State Railroad & Logging Historical Association. Last edited by Rick F. on Sun Sep 13, 2015 2:26 pm, edited 2 times in total. WV is my favorite ride destination. I have visited many of the same places, but, of course, not taken such stunning photos! PS Sorry about the bike, but rest assured, it is a common fix! Excellent as always Rick. Thanks for the tour. JimVonBaden wrote: Outstanding as usual Rick! Thanks! You certainly weren't kidding about all the beauty, neat roads, etc. in WV. I've been to a number of parts of the State previously by car, but there's nothing like experiencing it on a bike. I'd been wondering for the last couple of months why I was having trouble downshifting the GS on occasion. Eventually, just from the specific symptoms, I began to suspect that the clutch disc could be hanging up on the transmission input shaft. At that point, I started checking the BMWBMW and ADVrider tech posts and quickly found confirmation that this was the likely culprit. Bob's tech guys checked it out and agreed. Apparently, as part of the fix, they put in a new clutch disc (no argument from me), since the steel in the clutch splines is harder than the input shaft steel and can tear it up over time. Fortunately, the GS is still under warranty! BKling wrote: Excellent as always Rick. Thanks for the tour. Thanks--the pictures help remind me of different aspects of each trip, and it's always fun to share them with the rest of the gang. I was a little afraid of overloading the server with a 4-day trip report, but it seems to have worked okay. Hello Kitty wrote: Great stuff, Rick! What I'm trying to figure out is, how can you do well over 999.5 miles in one day, as you routinely do during your Epic Jaunts, while it takes me four days (and I'm really tired at the end)??! And I don't think it's the auxiliary fuel cell on your GS. Wow, thanks for the great addition! It's a wonder that the train (and the whole town, for that matter) isn't covered with grey soot... Did you go on the excursion? In reading about it, it really sounds like fun. I don't stop so much and when I do it's to put gas in the bike, go tinkle, burn a square, maybe shove some cashews or beef jerky down my throat and go. When Don and I rode to Sarasota last month, it was just about 1100 miles. Took us way longer than it should have (19 hours I think) because we (probably more me than Don) didn't manage stops as well as could have been done. We were keeping the speeds down considerably, but the last hour or two I was DONE and wound it up a bit. Funny thing is, when we got to Sarasota, I was absolutely fine. For me, the seat is the most important thing. A Russell seat will make a big difference!! If it works out, next time you're going on a trip, borrow mine and see for yourself! Rick F. wrote: Not far before Grafton, I encountered one of the weirder settings of the whole trip. Every imaginable antique farm implement was sitting somewhere in this yard. For good measure, there were several train cabooses in the background. As Calvin and Hobbes would have said, "There was treasure everywhere!" You'd probably enjoy this event a lot. For some reason their site doesn't mention it, or else I missed it, but they have quite a showing of antique tractors, stationary engines, and sundry farm equipment that gets the old-timers telling stories. Thanks--I'll take you up on your offer some time! I recall from our ride back from Summit Point that the seat on your GS did seem very comfortable. The show does look like fun, especially if they're selling John Deere churned homemade ice cream. I'm not much of a collector of things myself (as Peter Egan once wrote, "In any contest between the two, doing always beats having"), but I admire people who collect large yards full of interesting old mechanical stuff and then leave it spread all around for our viewing pleasure--and wonderment. 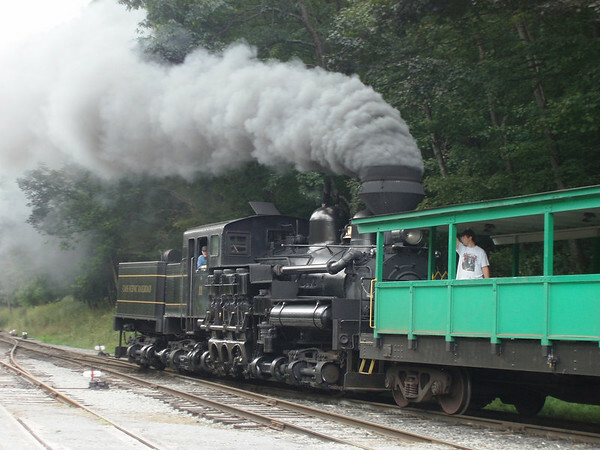 Some time, let me know what other must-do adventures there are in West Virginia. I can't wait to go back. PS--JVB, I'd like to see your WV recommendations, too! http://www.urbandictionary.com/define.php?term=square #2. I didn't know it either. Don taught me that one. No idea where it came from. Only thing I can think of is that the pack is square(ish) you can see it if someone has it in his pocket?